It's common for tech firms to offer generous family leave benefits for their own software engineers and other full-time staff, but paid leave advocates say it's still rare to require similar benefits for contracted workers such as janitors, landscapers, cafeteria crews and software consultants. "Given its size and its reach, this is a unique and hopefully trailblazing offering," said Vicki Shabo, vice president at the National Partnership for Women and Families. The new policy affects businesses with at least 50 U.S.-based employees that do substantial work with Microsoft that involves access to its buildings or its computing network. It doesn't affect suppliers of goods. Contractors would have to offer at least 12 weeks of leave to those working with the Redmond, Washington-based software giant; the policy wouldn't affect the contractors' arrangements with other companies. Leave-takers would get 66 percent of regular pay, up to $1,000 weekly. The policy announced Thursday rolls out over the next year as the company amends its contracts with those vendors. That may mean some of Microsoft's costs will rise to cover the new benefits, said Dev Stahlkopf, the company's corporate vice president and general counsel. "That's just fine and we think it's well worth the price," she said. Microsoft doesn't disclose how many contracted workers it uses, but it's in the thousands. The new policy expands on Microsoft's 2015 policy requiring contractors to offer paid sick days and vacation. Other companies such as Facebook have also committed to improve contractor benefits amid unionization efforts by shuttle drivers, security guards and other contract workers trying to get by in expensive, tech-fueled regions such as the San Francisco Bay Area and around Washington's Puget Sound. Facebook doesn't guarantee that contract workers receive paid parental leave, but provides a $4,000 new child benefit for new parents who don't get leave. A much smaller California tech company, SurveyMonkey, announced a paid family leave plan for its contract workers earlier this year. A federal paid parental leave plan proposed by President Donald Trump's daughter, Ivanka Trump, could rely on a similar model but has gained little traction. "Compared to what employers are doing, the government is way behind the private sector," said Isabel Sawhill, a fellow at the Brookings Institution who has urged the White House and Congress to adopt a national policy. Sawhill said it is "very unusual and very notable" that Microsoft is extending family leave benefits to its contract workers. Microsoft already offers more generous family leave benefits to its own employees, including up to 20 weeks fully paid leave for a birth mother. 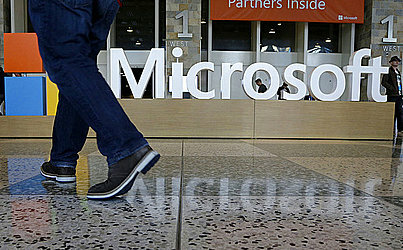 Microsoft's push to spread its employee benefits to a broader workforce "sends a message that something has to happen more systematically at the federal level," said Ariane Hegewisch, a program director for employment and earnings at the Institute for Women's Policy Research. Until then, she said, it's helpful that Microsoft seems willing to pay contracting firms more to guarantee their workers' better benefits. "Paid family leave is expensive and they acknowledge that," Hegewisch said. Otherwise, she said, contractors with many employees of child-bearing age could find themselves at a competitive disadvantage to those with older workforces.